Whether you choose the Trail of Orcholome or the Road to Elveros, you will be able to enjoy a whole bouquet of bonus features to accompany your journey to this exquisite RTG slot game. 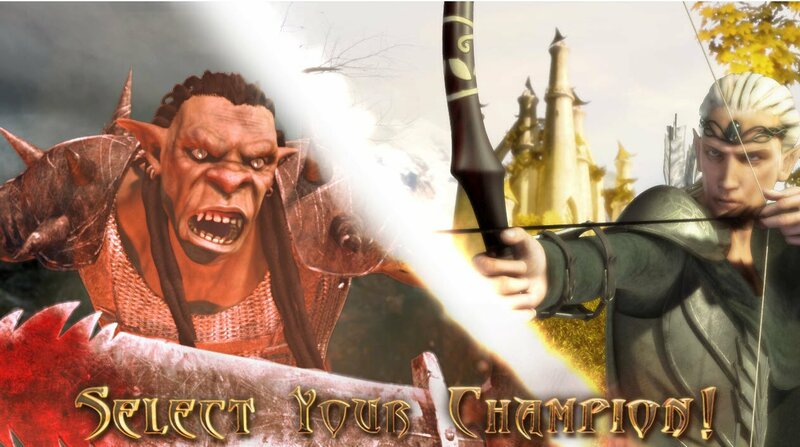 2014 is bringing a new age to the world of slot play and this Orc vs Elf 3D slot battle is full of free spins, multipliers and battle bonus rounds to entertain you until the death! Enter the ultimate in fantasy fighting, the match to end all matches. We begin by choosing out champion, will it be the grisly Orc, a foreboding presence with a menacing face and stance, or the sprightly Elf, bow and arrow in hand and golden flax hair with delicate features? 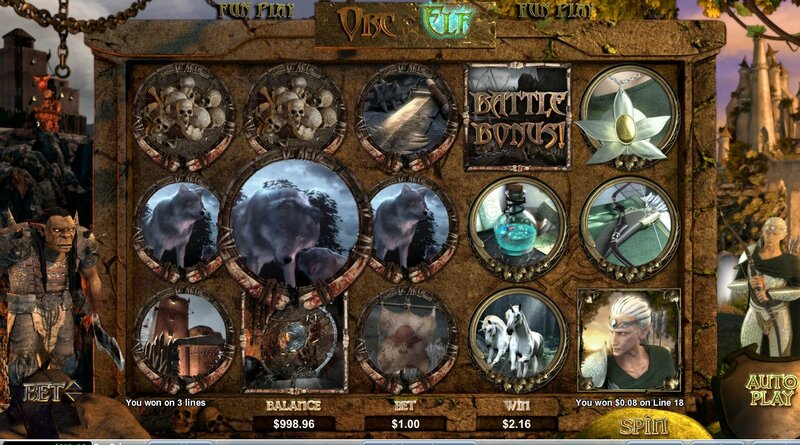 Play Orc vs Elf slot machine by RTG and test your wits in this epic battle, spin the reels and test your mettle on the field. 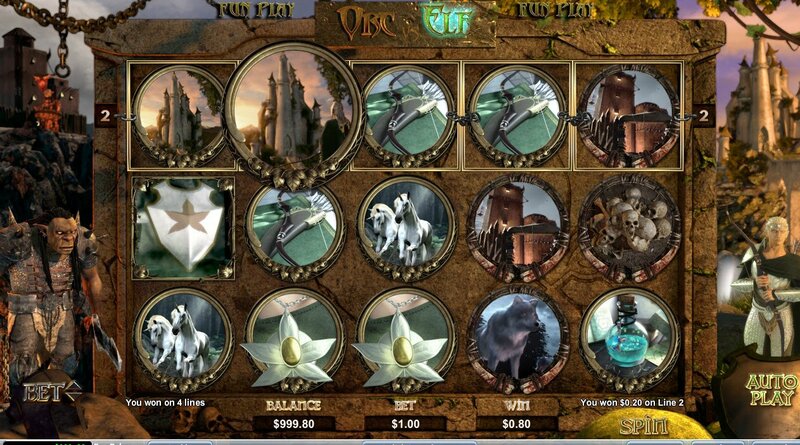 A 5-reel, 25 payline slot machine, Orc vs Elf Slot will being your screen to life with some innovative new characters. There is a LOT going on in this game and it is very playable indeed, I can barely tear myself away! RTG graphics and sound quality are at an all time high with this new slot machine offering. The music is suspenseful and accompanies the stunning graphics beautifully, with deep clarity, which make this fantasy fight one of epic greatness. There are fairytale castles and beautiful white unicorns frolicking, surrounded by worrisome werewolves howling at the night and skeleton heads in a pile. The light memories of childhood lore and myth surrounded and interwoven with dark, gruesome twists of overgrown forests and creatures lurking in the shadows. The battle between orc and Elf seems to be one of good vs evil, light vs dark. RTG's Orc vs Elf 3D slot machine is not just all about exquisite graphics and sublime music, you will also enjoy the Auto Play feature, which lets you refine your choices to determine a number of spins, to make sure your reels stop when a jackpot is won, or when a win exceeds a certain amount, or even to stop on any win. There is also the option to stop if any of the Orc vs Elf slot bonus features are triggered, so you can enjoy the ride in slow motion. The Elf's leaf clad vest will trigger a woodland spins feature and you'll enjoy a pause and free spins in the Orc vs Elf 3D slot battle challenge. There are many other wondrous bonus feature delights to keep you entertained and the auto play feature will let you go at your own pace, stopping as and when you wish, like a dream come true. -Make sure you have a couple hours to spare!